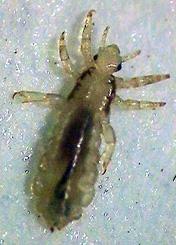 Lice (Figure 1) are small, wingless, grayish-white insects with flattened, elongate bodies and somewhat oval heads. They are about 1⁄16 to 1⁄8 inch long. ARE THERE DIFFERENT KINDS OF HUMAN LICE? There are several species or kinds of lice that feed on people. One species feeds specifically on the head and is called the head louse. The other two common species are the body louse and pubic louse (often referred to as the "crab" louse because of its crab-like shape). No, head lice are "obligate parasites" of humans, i.e., they must feed on humans in order to survive. Lice may live for several weeks on a person, but they rarely live more than 48 hours when removed from a person's body. CAN HEAD LICE HOP OR JUMP? No, head lice cannot hop, jump or fly. Their legs are adapted for crawling and for grasping a person's hair. DO HEAD LICE SPREAD DISEASES? No, head lice are not known to transmit any disease agents. However, secondary infections may result if the skin is broken by repeated scratching of the scalp. Nits are louse eggs. They are small (about 1⁄32 inch), white to cream color, and oval in shape with a distinct cap. Nits are often the first sign of a head lice infestation. Head lice glue their eggs to the base of the hair shaft, frequently behind the ears or on the nape of the neck. HOW MANY EGGS DOES A FEMALE HEAD LOUSE LAY? A female head louse produces about four eggs per day and a total of about 88 eggs during her lifetime. Lice are transferred by close personal contact with an infested person or by sharing their articles of clothing and personal items such as hats,barrettes, headbands, scarfs or caps, combs and brushes. HOW MANY HEAD LICE ARE USUALLY FOUND ON AN INFESTED PERSON? Typically, 10-15 head lice are found. The number of lice often depends on personal hygiene, for example, how often the person bathes, shampoos or changes and washes his/her clothing. Head lice have been found on people of all socio-economic levels. Children, particularly those of elementary school age, are most likely to get head lice because of their close contact and social interactions with each other (e.g., sharing hats, combs and brushes). IS IT TRUE THAT AFRICAN-AMERICANS DO NOT GET HEAD LICE? No. Although factors such as hair texture may make African-Americans less likely than Caucasians to get head lice, they are not immune to becoming infested. Lice cause intense itching of the scalp. Parents and teachers should watch for children who scratch their heads constantly or excessively. In such cases, check the scalp for lice. Nits will be found attached to the hair right near the scalp. If you're not sure what to look for, ask for help from someone who can positively identify the eggs or the insects. HOW CAN I CHECK MYSELF OR MY CHILD FOR HEAD LICE? One simple way to check for lice is to have the person hold their head over a light-colored towel. Then, brush the hair and scalp vigorously downward towards the towel. Dislodged lice will be found on the towel. Because infested people usually have few lice, you can easily miss finding them. So, if you suspect you have lice, you may want to repeat the process.. It is important that you carefully and thoroughly inspect the person's head, particularly the back of their neck and around their ears. Remember: dandruff, oil droplets in the hair and even flakes of hair spray can be confused with nits. Use a magnifying glass to help check for nits. When in doubt, consult a physician or your local health office for assistance. WHAT SHOULD BE DONE IF YOU SUSPECT SOMEONE IS INFESTED? They should seek help from their physician, county health department, or school nurse. The entire family needs to be checked and treated, if necessary. In the case of school-age children, notify the teacher or principal immediately. Although this may be a cause for embarassment, other children in the class must be checked by a doctor, school nurse or other health official because the problem will continue in the class and your child may end up getting infested with lice again from another source. Letters can be sent home to notify each family of the problem and the possible need for them to take measures to prevent further spread of lice to other family members. The letters should help solve the problem and should not be used to single out any child as the cause of the problem. If your child plays with children that do not attend the same school, it's important to talk to their parents as well because in these situations, the problem will not stop if you only focus on the school. Shampooing with regular non-medicated shampoos can help prevent an infestation, but it will not eliminate an active one. Washable clothing, hats, head bands, bed linen, towels and other personal items (such as brushes and combs) should be washed in hot (120F or higher) soapy water, then dried in a clothes drier for at least 20-30 minutes. Woolen or other non-washable clothing can be dry-cleaned, but this additional expense can be avoided by simply isolating the articles for 1-2 days. Items such as stuffed toys do not need special treatment; however, if it make you feel more at ease, you can put them in the clothes dryer for 45-60 minutes. WHAT MEDICATIONS ARE EFFECTIVE AGAINST LICE? Several "over-the-counter" products (pediculicides) are available to you at most drugstores and othe retail stores. Because of the extensive and repeated uses of the products containing pyrethrins and permthrin, populations of head lice are becoming resistant to their effect. DO THESE MEDICATIONS KILL THE EGGS? Over-the-counter products work well against the nymphs and adults, but many will not kill the eggs. Read and follow the product labels carefully in terms of how much and how often you need to use on yourself or your child. Consult your family doctor about what is best for you to use. Mechanical removal of louse eggs helps reduce the number of lice that might hatch on the scalp. Even if you use Nix, the egg "shells" may remain attached to the hairs, giving the impression of an active infestation. Since children who are declared "nit-free" can return to class sooner, removing nits has a positive impact on their morale and lessens disruption to their school activities. Special combs are provided with the pediculicides and should be used according to the product instructions. Nits are more easily removed after shampooing the hair, when it is still damp. DO VINEGAR RINSES HELP REMOVE LICE EGGS? No, vinegar will not dissolve the cement-like substance that the female louse uses to attach her eggs to the hair shaft. A nit comb is the only real reliable method for removing the eggs. Although trimming the hair is not necessary, it does makes it easier to remove all of the nits. DO I NEED TO SPRAY MY HOME WITH AN INSECTICIDE IF SOMEONE IN MY FAMILY HAS HEAD LICE? No, lice cannot survive for more than about 24-36 hours when removed from a person and they do not live in cracks or crevices like cockroaches or other household pests. Spraying furniture, carpets and bedding with an insecticide serves no real purpose other than providing some margin of psychological comfort. Although such sprays kill an occasional stray louse, family members who are already being treated with insecticidal shampoos would be exposed unnecessarily to additional pesticides. If anything, vacuuming carpets and furniture will remove stray lice. WHAT ELSE SHOULD BE DONE IN THE CLASSROOM TO GET RID OF LICE? The need for delousing measures in a school depend largely on the age of the students and the layout of the classroom. As in the home, vacuuming carpeting and/or sleeping mats can help. Mats with vinyl or other non-fabric coverings can be cleaned with hot, soapy water. Clothing or personal items (such as those described in question 17) that students have left in a closet, storage area or desk should be removed and deloused. Application of insecticides in the classroom is not necessary and is strongly discouraged. If there's a concern about school buses, the seats and headrests can be cleaned with ordinary upholstery cleaner or other appropriate cleaner. For information on the various lice that infest humans, see Insect Note Biology and Control of Human Lice.